What is Commercial Endorsement? If you would like to work on a vessel whether it be a Powerboat, Yacht or Motor boat then you will need to apply for Commercial Endorsement. A Motor or sailing vessel in commercial use (i.e. Charter) for sport or pleasure, carrying no cargo and not more than 12 paying passengers. Once you have completed any of the above, you have a couple of options depending on where you see yourself working. The first and most important step is to complete ENG1 or ML5 medical. 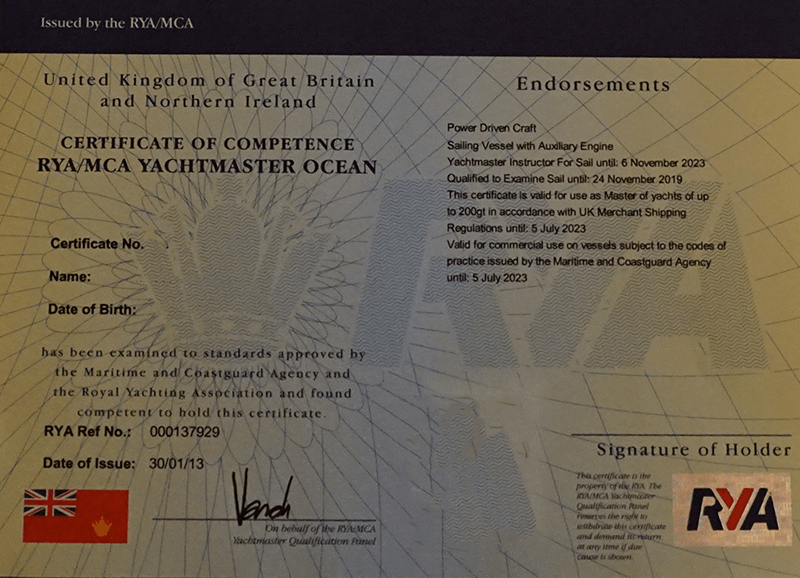 The RYA online Professional Practices and Responsibilities course, known as PPR. Some overseas employers, Superyachts or flag states will require STCW Basic Safety Training Certificates. If you are thinking of working outside the UK then we would recommend getting STCW. If you hold an RYA Yachtmaster Offshore or Ocean then having STCW allows the holder to skipper a vessel up to 200 gross tonnes. Such a vessels may be larger than 24m in length. This qualification issometimes called the RYA Master of Yachts 200GT.